Cerebral venous thrombosis (CVT) is an uncommon cause of stroke with extremely varied clinical presentations, predisposing factors, imaging findings, and outcomes. The first description of CVT, appearing in the French literature in 1825, was by Ribes, in a 45-year old man who died after a 6-month history of severe headache, epilepsy, and delirium. In 1957, Padmavati et al., for the first time from India, reported 15 cases of CVT in puerperium in an epidemiological study evaluating the causes of hemiplegia in 44 women. It was at that time recognized as a diagnosis which was mostly made at autopsy and considered lethal. With the advent of newer and more sophisticated imaging techniques and increasing awareness of this entity, the incidence of this disease has increased and the prognosis has improved as compared to the older series. Accurate and prompt diagnosis of CVT is crucial because timely and appropriate therapy can reverse the disease process and significantly reduce the risk of acute complications and long-term squel. The objective of this review was to assess the demographic profile, frequency of different clinical features, risk factors, and prognostic outcome in patients suffering from CVT from India. We conducted a literature search on the Medline database to identify the published studies from India that evaluated the demographic profile, clinical features, risk factor profile, and prognostic outcome of patients with CVT. The following keywords were used: Cerebral vein thrombosis, India, CVT, intracranial embolism or thrombosis, cerebral veins, intracranial thrombosis, sinus thrombosis intracranial. » What is the Magnitude of the Problem in India? Most of the earlier case series from India reported a higher proportion of women suffering from CVT than men, except a series of 110 angiographically proven CVT by Parikh et al., which had a male dominance. A large hospital-based case series of 317 patients with CVT recruited over a period of 8΍ years during the 80's had only 15 male patients. This gender bias was usually attributed to gender-specific risk factors like the usage of oral contraceptives (OCs) and the influence of other factors such as pregnancy, puerperium, and hormone replacement therapy. In contrast to this, the recent case series from India do not show this trend of female dominance. In their study of 428 patients of CVT recruited from a tertiary care hospital of Hyderabad, Narayan et al., had a larger proportion of males than females. Showing a similar trend, a large prospective study which recruited 612 consecutive patients of CVT from various hospitals of Mumbai had a male to female ratio of 3:2. The plausible reason for this change in gender trends over the last two decades could be the improvement in obstetric care. » What are the Etiological Factors for Cerebral Venous Thrombosis? More than 100 putative causes of CVT have been described in the literature. The risk factors for venous thrombosis, in general, are linked classically to the Virchow triad of stasis of the blood, changes in the vessel wall, and changes in the composition of blood. Etiological factors are usually divided into acquired risks (e.g. surgery, trauma, pregnancy, puerperium, antiphospholipid syndrome, cancer, exogenous hormones) and genetic risks (inherited thrombophilia). Drugs like oral contraceptives (OCs), steroids, hormone replacement therapy, and oncological treatments have been implicated in the causation of CVT. [Table 1] lists the various etiological factors responsible for CVT. In the recent times, a change in this trend has been noted. The NIVSR cohort study and the study by Pai et al., have reported only 9.8% and 8% patients in the postpartum or pregnant state, respectively., , This percentage is much lower than reported in prior studies. The improvement in obstetric care could be the possible cause for this change. There is ample evidence to suggest a causal relationship between oral contraceptives (OCPs) and CVT. In a meta-analysis of 17 studies, summary odds ratio for developing cerebral venous sinus thrombosis (CVST) was 5.59 in women using OCPs compared with controls. It is clear from this study that the use of OCs is associated with an increased risk of CVT, that the great majority of younger, non pregnant women with CVT are OC users, and that the risk of CVT with OC use in women is greater among those with a hereditary prothrombotic factor. In developed countries, OC as a risk factor for CVT has been more commonly reported compared to the developing countries. In the prospective International Study on Cerebral Vein and Dural Sinus Thrombosis (ISCVT) cohort of 624 adults with CVT, 46% of women who developed CVT were on OC's, which made it the third most important risk factor; whereas, in a study by Khealani et al., of 109 patients of CVT from Pakistan and the middle east, only 14% of women were using OCs. , The NIVSR study cohort also reported that only 11.4% patients had usage of OCs. All the large series from India have shown a much lower proportion of OC usage as a risk factor for CVT compared to the series from west. ,,,, This could be due to the different sociocultural milieu of our patients compared to the western countries. The most common risk factor identified for CVT throughout the world is often a prothrombotic condition. In the ISCVT cohort, a prothrombotic condition was found in 34% of all patients, and a genetic prothrombotic condition was found in 22% of all patients. Almost all the large series from the western literature have a large proportion of patients having a prothrombotic condition as a risk factor. Most of the earlier published studies from India did not have information regarding these inherited prothrombotic states due to lack of laboratory facilities and resources to conduct these tests. But in recent times, Pai et al. recruited 612 consecutive patients from various hospitals of Bombay over a period of 9 years and tested them for the common thrombophilia markers (protein C [PC], protein S, antithrombin REVIEW ARTICLE, and factor V Leiden [FVL] mutation). 18% of the patients were positive for the thrombophilia markers studied. PC deficiency was the most common thrombophilia marker followed by a deficiency of protein S, FVL mutation, and AT deficiency. This study had a similar proportion of patients with a genetic prothrombotic state when compared to that reported from developed countries. Similarly, Narayan et al., also reported 12.3% patients having a genetic prothrombotic condition as a risk factor for CVT. The proportion of CVT patients with a prothrombotic condition in India is also similar to that of Western countries and has been probably under-reported in the earlier studies (due to lack of laboratory facilities). Although infective causes of CVT were frequently reported in the earlier series, they account for a very small percentage of patients in the recent studies. , This could be due to the availability of potent broad spectrum antibiotics in today's era. Although there is a high prevalence of tuberculosis in India, the association of tubercular meningitis (TBM) with CVT has rarely been reported. Literature search on Medline with the key words of "CVT and tuberculosis" yielded only a few case reports. ,, Pai et al. reported associated tuberculosis as an etiological factor for CVT in 14.3% of patients. But the authors have not commented about the type of tuberculosis (whether it was TBM or pulmonary tuberculosis). The postulated mechanisms of CVT in tuberculosis are: Endothelial injury due to the inflammatory response, sluggish venous flow, increased platelet aggregation and release of procoagulant factors. Due to the lack of larger studies, it is difficult to establish if the co-occurrence of these two diseases is due to a chance association or it is causally related. If a patient has clinical features and signs suggestive of chronic meningitis along with the cerebrospinal fluid examination and neuroimaging findings suggesting the presence of TBM; or, if there is evidence of tuberculosis elsewhere, then the suspicion of concomitant TBM should arise in the clinician's mind. Similarly, in a patient of diagnosed TBM, worsening of a preexisting headache, and an impairment of consciousness with the presence of seizures should raise the suspicion of CVT, that can be confirmed on imaging. When we compare the etiological factors of CVT in the western series with the recently published Indian series, there are a similar proportion of patients with prothrombotic conditions and pregnancy and puerperium in both [Table 2] and [Table 3]. But, the usage of OC's is still found much less commonly in the Indian literature compared to Western studies. Despite the continuous description of new causes, in about 13% of patients, no etiology can be found, as has been seen in the recent series. Therefore, the search for an etiology remains a difficult problem in CVT. It requires an extensive initial workup and when no cause is found, a long term follow-up with repeated investigations. In contrast to the arterial stroke, which can be easily diagnosed clinically in a majority of the cases, CVT has no single pattern of presentation, and it may be difficult to diagnose it on clinical grounds alone. Clinical findings in CVT fall into two major categories: Those related to increased intracranial pressure due to impaired venous drainage; and, those related to focal brain injury from venous ischemia/infarction or hemorrhage. Headache is the most frequent and most of the times, the earliest symptom of CVT. In the NIVSR cohort, 88.3% patients had headache as the presenting complaint with CVT. Headache may be acute, sub-acute, chronic or may even have a thunderclap-like presentation. In most of the cases, headache precedes the development of all other features by days, weeks and sometimes even months. The mechanism of headache is postulated to be the stretching of nerve fibers in the walls of the occluded sinus and local inflammation, as suggested by the evidence of contrast enhancement of the sinus wall surrounding the clot. The mental status may be quite variable, with patients showing no change in alertness, developing mild confusion or progressing to coma. Earlier case series from India reported that 43% to 93% of patients had an altered sensorium at presentation., ,, Recent studies show a lower proportion of patients having changes in sensorium at presentation. The reason for this decrease is probably due to patients seeking medical help earlier in the recent times. Focal neurological deficit may occur depending on the area involved. Thus, hemiparesis may be encountered, and in some cases of sagittal sinus thrombosis, there is involvement of bilateral lower extremities. Papilledema may be seen on fundoscopy in chronic cases or those with a delayed presentation but is less common in acute cases. [Table 2] depicts the distribution of different clinical features in the different series from India. In the NIVSR cohort, a stroke-like presentation was present in 28.5% patients, isolated seizures in 29.4%, benign intracranial hypertension-like presentation in 18.2%, encephalopathy in 25.2%, and psychosis was observed in 1.8% patients. In a cohort of 131 patients who presented with papilledema and were clinically suspected to be having idiopathic intracranial hypertension, 10% patients were confirmed to be having a CVT when magnetic resonance imaging (MRI)/magnetic resonance venography (MRV) was performed. 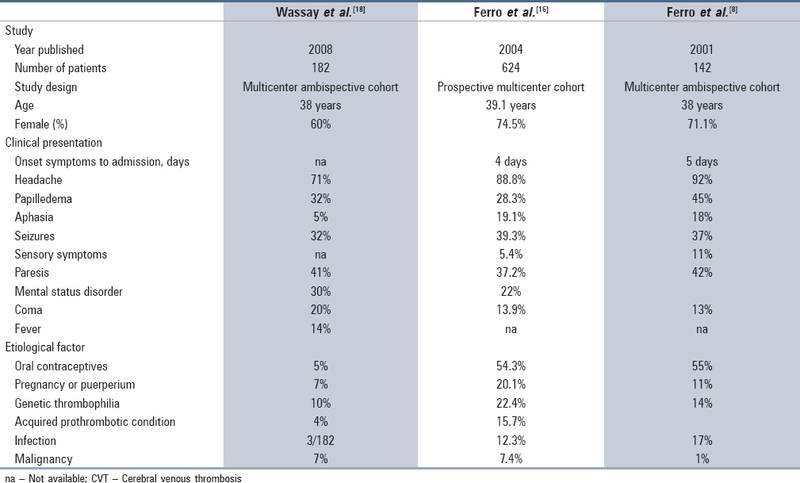 There is almost similar kind of distribution of clinical features from the series of CVT from India and western countries [Table 2] and [Table 3]. » How to Make the Diagnosis of Cerebral Venous Thrombosis? The diagnosis of CVT is based on a high degree of clinical suspicion followed by imaging confirmation. The imaging findings of CVT can be categorized as direct, as when there is a visualization of cortical or dural sinus thrombus; or, indirect, as when there are ischemic changes related to the venous outflow disturbance. Cranial computed tomography (CT) is usually the first, and in countries like ours, the only investigation performed in the emergency department. More frequently, the contrast-enhanced CT scan reveals indirect signs such as local or generalized brain swelling, contrast enhancement of the falx and tentorium, and localized hypodense or hyperdense areas reflecting hemorrhagic transformation. The diagnostic value of contrast CT is significantly increased by combining it with helical CT venography that has a sensitivity of 95% in depicting the venous anatomy. In a suspicious case, the diagnosis may be confirmed by more sensitive imaging techniques such as an MRI and MRV. The conventional MR sequences show patent dural sinuses as flow voids. The coronal images are best suited for visualization of the superior sagittal, transverse, and sigmoid sinuses. A plane parallel to the dural sinus offers better depiction of the extent of the thrombus within them. In the acute stage, the thrombus may be seen as iso-intense on T1W but hypointense on T2W MRI sequences. In such a situation, either a gradient sequence or an MRV is warranted, the latter being the investigation of choice. The vascular imaging includes MRV and conventional angiography. MRV is most commonly used to confirm the diagnosis of CVT in a suspected case especially in the acute stage, as direct visualization of the thrombus may be difficult on MR (as it is isointense on T2). Contrast MRV is preferred although MRV may also be performed without the use of a contrast agent using the time-of-flight technique or the phase contrast technique. Because these techniques use MR flow phenomena for contrast generation, they are subject to flow-related image artifacts. [Figure 2] depicts a case of superior sagittal sinus thrombosis. A 64-slice multi-detector row CT and CT venogram have been used in some centers for the diagnosis of venous sinus thrombosis and has been found to be 100% sensitive and specific. Cerebral catheter angiography is rarely used for the diagnosis of CVT because of the invasive nature of this diagnostic modality; although conventional angiography best demonstrates the dynamics of the intracranial circulation. The venous collateral circulation is also best appreciated on the conventional angiography. Dilated tortuous collateral veins develop in the setting of chronic venous hypertension related to the veno-occlusive disease. This constellation of findings on the venous phase of the angiogram has been referred to as the "pseudophlebitic pattern." The ability to develop venous collateral circulation accounts for the variable clinical presentations and the unpredictable outcome of CVT. There is no confirmatory laboratory test that can confidently rule out CVT in the acute phase of the disease. Routine blood studies consisting of a complete blood count, chemistry panel, prothrombin time, and activated partial thromboplastin time (PTT) are recommended for patients with suspected CVT. The results from these tests may suggest the presence of conditions that contribute to the development of CVT such as an underlying hypercoagulable state, an infection, or an inflammatory process. Screening for potential prothrombotic conditions that may predispose to CVT is recommended. The D-dimer measurement is a diagnostic screening tool for the assessment of patients with possible CVT. However, a normal D-dimer value cannot exclude the presence of CVT, especially in patients with isolated headache or with thrombosis of a single sinus. The immediate goals of anticoagulant (AC) therapy are to recanalize the occluded sinus, prevent propagation of the thrombus and to treat the underlying prothrombotic state. Heparin is the obvious therapy for any venous thrombosis yet AC therapy has been controversial, due to the high incidence of spontaneous hemorrhagic infarcts in patients with CVT. The first placebo-controlled trial of intravenous (IV) heparin by Einhδupl et al. was stopped after 20 patients were enrolled because the investigators found a statistically significant beneficial effect. The second randomized trial by De Bruijn et al. compared body weight adjusted subcutaneous low molecular weight heparin (LMWH) with placebo in 60 patients with CVST. A poor outcome - defined as death or Barthel index <15 - was observed after 3 weeks in six of the 30 patients treated with LMWH (20%) compared with seven of the 29 controls (24%). After 3 months, 3 patients (10%) in the LMWH group and 6 patients (21%) in the placebo group had a poor outcome that corresponded to a non-significant absolute risk reduction of 11% in favor of the active treatment. No new intracerebral hemorrhage (ICH) or secondary worsening of the 15 patients with pretreatment hemorrhage was observed in the LMWH group. There is no consensus on the modalities of treatment with heparin. Some recommend the use of LMWH because of the better pharmacokinetics and the lower risk of thrombocytopenia. Guidelines from India, Europe and America recommend that patients with CVT without contraindications for AC should be treated either with activated partial thromboplastin time adjusted IV heparin or body-weight-adjusted LMWH. ,, The presence of concomitant intra-cranial hemorrhage related to CVT is not a contraindication for heparin therapy. The optimal duration of heparin is not established. As for deep vein thrombosis of the leg, after a few days of heparin, once the patient is stabilized, oral ACs are started to reduce the risk of heparin-induced thrombocytopenia. Warfarin is usually adjusted to obtain an International Normalized Ratio between 2 and 3. The usually recommended duration of treatment is 3-6 months, particularly when there is a known acute cause for CVT, such as minor head trauma, postpartum state, or local infection. In contrast, prolonged treatment is warranted whenever there is a continuing risk of thrombosis, such as lengthy immobilization, malignant disease, inflammatory disease such as systemic lupus erythematosus or Behcet's disease, inherited thrombophilia or recurrent venous thrombosis. In a prospective observational study by Kumar et al., 19 patients received intrasinus thrombolytic therapy in whom clinical deterioration continued in the form of rapid worsening of consciousness or aggravation of neurological deficits despite adequate AC. At discharge, 79% patients had a good outcome and were either asymptomatic or had only mild deficits and were independent for activities of daily living. 3 patients died, and one survived with severe neurological deficits. At a median follow-up of 6.3 months, 14 (74%) patients had no or mild neurological deficits. The leading cause of death is the hemorrhagic conversion of large venous infarcts resulting in brain herniation. In these situations, emergency decompressive hemicraniectomy can prevent death. A retrospective registry of cases of acute CVT treated with decompressive surgery (craniectomy or hematoma evacuation) in 22 centers and a systematic review of all published cases of CVT treated with decompressive surgery was conducted by Ferro et al. Of the sixty-nine patients, decompressive craniectomy was performed in 45 patients, hematoma evacuation was performed in 7, and both interventions were performed in 17 patients. At the last follow-up, 17.4% patients had an unfavorable outcome. 37.7% patients had an mRS score 0-1, 56.5% had an mRS score 0-2, 5.8% were alive with the mRS score being 4-5, and 15.9% patients died. The authors concluded that in patients with CVT with a large parenchymal lesion causing herniation, decompressive surgery was life-saving and often resulted in a good functional outcome, even in patients with severe clinical manifestations. Pregnancy induces several prothrombotic changes in the coagulation system that persists at least during early puerperium. Hypercoagulability worsens after delivery as a result of volume depletion and trauma. The greatest risk period for the occurrence of CVT is in the third trimester and the first 4 postpartum weeks. CVT during the first trimester is rare, and there are only few case reports of such occurrences in the literature. , In patients who have had an occurrence of CVT in the prior pregnancy, the risk of recurrence in the future pregnancy is low. Dentali et al. in a systematic review estimated the occurrence of one episode of CVT among 103 reported pregnancies in women with a previous history of CVT (0.97%, range 0-2.9%). On the basis of the available evidence, CVT is not a contraindication for future pregnancies. Unfortunately, there are no reliable data about antithrombotic prophylaxis during subsequent pregnancies in women who have previously suffered an episode of CVT. Patients who have had CVT and also possess a transient risk factor are advised to use LMWH prophylaxis during the postpartum period only (4-6 weeks). In patients who have a history of recurrent CVT, venous thromboembolism after CVT, or the first CVT with severe thrombophilia (i.e. homozygous prothrombin G20210A; homozygous factor V Leiden thrombophilia; deficiencies of protein C, protein S, or antithrombin; combined thrombophilia defects; or antiphospholipid syndrome) long-term ACs have to be given. If these patients conceive, then they cannot be given vitamin K antagonists (e.g. warfarin) as it is associated with fetal dysgenesis and bleeding in the fetus and neonate. The choice of AC during pregnancy would be low molecular weight heparin over unfractionated heparin, as it is not associated with teratogenicity or increased risk of fetal bleeding. In earlier studies, CVT was diagnosed mainly at autopsy and was considered to be lethal, with the mortality figures ranging from 30% to 50%. With the advent of newer imaging modalities and increased sensitization towards diagnosing CVT, the mortality rates have decreased. The main cause of death is either transtentorial herniation due to a massive hemorrhagic infarction or due to an associated complication like sepsis, uncontrolled seizures, or pulmonary embolism. Ribes MF. Des recherches faites sur la phlebite Revue Medical Francais et Etrangere er Journal de clinique del ′Hotel Dieu et de la Charite de Paris 1825;3:5. Padmavati S, Gupta S, Singh B. A clinical study of 44 cases of hemiplegia in adult women. Neurol India 1957;5:59-65. Bansal BC, Gupta RR, Prakash C. Stroke during pregnancy and puerperium in young females below the age of 40 years as a result of cerebral venous/venous sinus thrombosis. Jpn Heart J 1980;21:171-73. Abraham J, Rao PS, Inbaraj SG, Shetty G, Jose CJ. An epidemiological study of hemiplegia due to stroke in South India. Stroke 1970;1:477-81. Banerjee AK, Varma M, Vasista RK, Chopra JS. Cerebrovascular disease in north-west India: A study of necropsy material. J Neurol Neurosurg Psychiatry 1989;52:512-5. Panagariya A, Maru A. Cerebral venous thrombosis in pregnancy and puerperium - A prospective study. J Assoc Physicians India 1997;45:857-9. 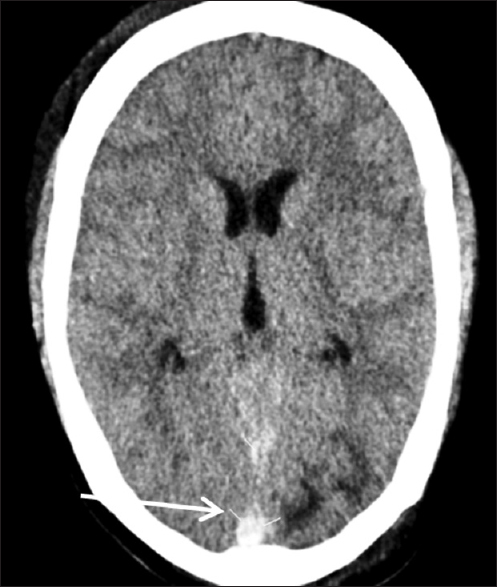 Nagaraja D, Taly AB, Das S: Puerperal cerebral venous thrombosis in India. In: Progress in Clinical Neurosciences. Sinha KK, Chandra P. (Eds), NSI Publication. Ranchi 1989; 165-177. Ferro JM, Correia M, Pontes C, Baptista MV, Pita F, Cerebral Venous Thrombosis Portuguese Collaborative Study Group (Venoport). Cerebral vein and dural sinus thrombosis in Portugal: 1980-1998. Cerebrovasc Dis 2001;11:177-82. Coutinho JM, Zuurbier SM, Aramideh M, Stam J. The incidence of cerebral venous thrombosis: A cross-sectional study. Stroke 2012;43:3375-7. Narayan D, Kaul S, Ravishankar K, Suryaprabha T, Bandaru VC, Mridula KR, et al. Risk factors, clinical profile, and long-term outcome of 428 patients of cerebral sinus venous thrombosis: Insights from Nizam′s Institute Venous Stroke Registry, Hyderabad (India). Neurol India 2012;60:154-9. Parikh PM, Sukthankar RU, Parikh A, Pipalia DH, Sidhva SJ, Ramakanten R, et al. Cerebral venous thrombosis. J Assoc Physicians India 1987;35:349-51. Nagaraja D, Taly AB. Cerebral venous thrombosis. J Assoc Physicians India 1987;35:876. Pai N, Ghosh K, Shetty S. Hereditary thrombophilia in cerebral venous thrombosis: A study from India. Blood Coagul Fibrinolysis 2013;24:540-3. Srinivasan K. Cerebral venous and arterial thrombosis in pregnancy and puerperium. A study of 135 patients. Angiology 1983;34:731-46. Buccino G, Scoditti U, Pini M, Tagliaferri AR, Manotti C, Mancia D. Low-oestrogen oral contraceptives as a major risk factor for cerebral venous and sinus thrombosis: Evidence from a clinical series. Ital J Neurol Sci 1999;20:231-5. Ferro JM, Canhão P, Stam J, Bousser MG, Barinagarrementeria F, ISCVT Investigators. Prognosis of cerebral vein and dural sinus thrombosis: Results of the International Study on Cerebral Vein and Dural Sinus Thrombosis (ISCVT). Stroke 2004;35:664-70. Khealani BA, Wasay M, Saadah M, Sultana E, Mustafa S, Khan FS, et al. Cerebral venous thrombosis: A descriptive multicenter study of patients in Pakistan and Middle East. Stroke 2008;39:2707-11. Wasay M, Bakshi R, Bobustuc G, Kojan S, Sheikh Z, Dai A, et al. Cerebral venous thrombosis: Analysis of a multicenter cohort from the United States. J Stroke Cerebrovasc Dis 2008;17:49-54. Kakkar N, Banerjee AK, Vasishta RK, Marwaha N, Deodhar SD.Aseptic cerebral venous thrombosis associated with abdominal tuberculosis. Neurol India 2003;51:128-9. Fiorot Júnior JA, Felício AC, Fukujima MM, Rodrigues CA, Morelli VM, Lourenço DM, et al. Tuberculosis: An uncommon cause of cerebral venous thrombosis? Arq Neuropsiquiatr 2005;63 (3B):852-4. Verma R, Lalla R, Patil TB, Tiwari N. A rare presentation of cerebral venous sinus thrombosis associated with tubercular meningitis. 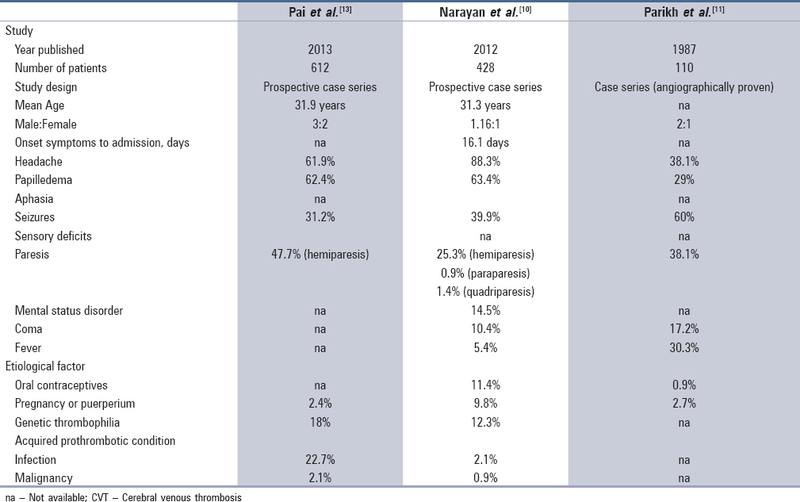 BMJ Case Rep 2013; doi: 10.1136/bcr-2013-009892. Kalita J, Chandra S, Misra UK. Significance of seizure in cerebral venous sinus thrombosis. Seizure 2012;21:639-42. Nagpal RD. Dural sinus and cerebral venous thrombosis. Neurosurg Rev 1983;6:155-60. Nagaraja D, Taly AB, Sarala Das: Puerperal cerebral venous thrombosis. In: Progress in Clinical Neurosciences, Sinha, K.K. and Chandra, P. (Eds) NSI Publication, Ranchi 1987; 325-338. Lin A, Foroozan R, Danesh-Meyer HV, De Salvo G, Savino PJ, Sergott RC. 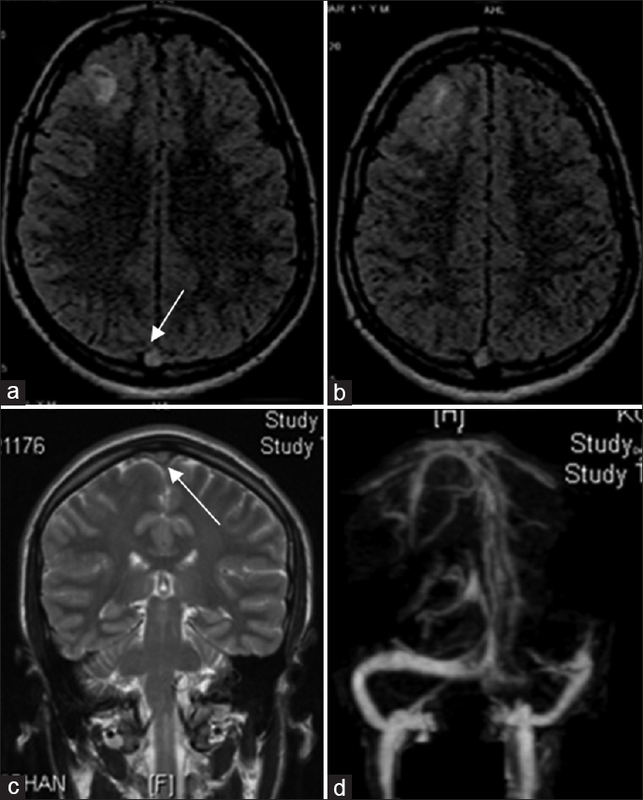 Occurrence of cerebral venous sinus thrombosis in patients with presumed idiopathic intracranial hypertension. Ophthalmology 2006;113:2281-4. Prasad K, Kaul S, Padma MV, Gorthi SP, Khurana D, Bakshi A. Stroke management. Ann Indian Acad Neurol 2011;14:S82-96. Saposnik G, Barinagarrementeria F, Brown RD Jr, Bushnell CD, Cucchiara B, Cushman M, et al. Diagnosis and management of cerebral venous thrombosis: A statement for healthcare professionals from the American Heart Association/American Stroke Association. Stroke 2011;42:1158-92. Misra UK, Kalita J, Bansal V. D-dimer is useful in the diagnosis of cortical venous sinus thrombosis. Neurol India 2009;57:50-4. Dentali F, Squizzato A, Marchesi C, Bonzini M, Ferro JM, Ageno W. D-dimer testing in the diagnosis of cerebral vein thrombosis: A systematic review and a meta-analysis of the literature. J Thromb Haemost 2012;10:582-9. Einhäupl KM, Villringer A, Meister W, Mehraein S, Garner C, Pellkofer M, et al. Heparin treatment in sinus venous thrombosis. Lancet 1991;338:597-600. De Bruijn SFTM, Stam J, for the Cerebral Venous Sinus Thrombosis Study Group. Randomized, placebo-controlled trial of anticoagulant treatment with low-molecular-weight heparin for cerebral sinus thrombosis. Stroke 1999; 30: 484-488. Stam J, de Bruijn S, deVeber G. Anticoagulation for cerebral sinus thrombosis. Stroke 2003;34:1054-5. Nagaraja D, Rao BS, Rao BSS, Taly AB, Subhash MN. Randomized controlled trial of heparin in puerperal cerebral venous/sinus thrombosis.NIMHANS J 1995;13:111-5. Nagaraja D, Haridas T, Taly AB, Veerendrakumar M, SubbuKrishna DK. Puerperal cerebral venous thrombosis: Therapeutic benefit of low dose heparin. Neurol India 1999;47:43-6. Misra UK, Kalita J, Chandra S, Kumar B, Bansal V. Low molecular weight heparin versus unfractionated heparin in cerebral venous sinus thrombosis: A randomized controlled trial.Eur J Neurol 2012;19:1030-6. Pillai LV, Ambike DP, Nirhale S, Husainy SM, Pataskar S. Cerebral venous thrombosis: An experience with anticoagulation with low molecular weight heparin. Indian J Crit Care Med 2005;9:14-8. Einhäupl K, Stam J, Bousser MG, De Bruijn SF, Ferro JM, Martinelli I, et al. EFNS guideline on the treatment of cerebral venous and sinus thrombosis in adult patients. Eur J Neurol 2010;17:1229-35. Canhão P, Falcão F, Ferro JM. Thrombolytics for cerebral sinus thrombosis: A systematic review. Cerebrovasc Dis 2003;15:159-66. Kumar S, Rajshekher G, Reddy CR, Venkateswarlu J, Prabhakar S. Intrasinus thrombolysis in cerebral venous sinus thrombosis: Single-center experience in 19 patients. Neurol India 2010;58:225-9. Garge SS, Shah VD, Surya N, Khadilkar SS, Modi PD, Ghatge SB. Role of local thrombolysis in cerebral hemorrhagic venous infarct. Neurol India 2014;62:521-4. Haghighi AB, Mahmoodi M, Edgell RC, Cruz-Flores S, Ghanaati H, Jamshidi M, et al. Mechanical thrombectomy for cerebral venous sinus thrombosis: A comprehensive literature review. Clin Appl Thromb Hemost 2013;20:507-15. Murthy JM. Cerebral venous thrombosis: Endovascular therapy. Neurol India 2014;62:485-6. Ferro JM, Crassard I, Coutinho JM, Canhão P, Barinagarrementeria F, Cucchiara B, et al. Decompressive surgery in cerebrovenous thrombosis: A multicenter registry and a systematic review of individual patient data. Stroke 2011;42:2825-31. Aaron S, Alexander M, Moorthy RK, Mani S, Mathew V, Patil AK, et al. Decompressive craniectomy in cerebral venous thrombosis: A single centre experience. J Neurol Neurosurg Psychiatry 2013;84:995-1000. Wilterdink JL, Easton JD. Cerebral ischemia in pregnancy. Adv Neurol 2002;90:51-62. Hanprasertpong T, Hanprasertpong J, Riabroi K. Cerebral venous sinus thrombosis in early pregnancy: An unusual presentation of primary antiphospholipid syndrome. J Obstet Gynaecol Res 2009;35:1125-8. Martín-Araguz A, Moreno-Martínez JM, García de la Rocha ML, Fernández-Armayor V, Delgado-Reyes S, Revilla-Valle B, et al. Lateral sinus thrombosis in the first three months of pregnancy. Rev Neurol 1997;25:234-6. Dentali F, Gianni M, Crowther MA, Ageno W. Natural history of cerebral vein thrombosis: A systematic review. Blood 2006;108:1129-34. Netravathi M.,Jaychandran R.,M. Bhat,R. Christopher,Satishchandra P.